Chartwell Tachochart Lucas DS/AT CK801/1101 (Pack of 100) CK801/1101G Pack of 1 "Printed on special pressure sensitive paper, to a very exacting specification laid down by EC law. Kienzle (Lucas) dual standard and automatic veeder root VRC8300 and VRC8400 series (125KH/H). Jaeger new generation." 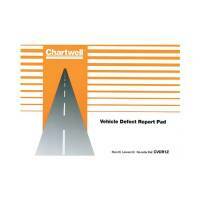 Chartwell Vehicle Defect Report Pad CVDR1 Pack of 1 Carbon copy paper so a record can be kept in the vehicle. Handy A5 size to keep in the cab. Easy to read standard form for quick review. Twenty five individual reports sheets for extended use. Each pad has 50 pages.